Sewing is like therapy to me. When I get the urge, I sit down to my machine and get creative. I can sit there and sew for hours and not worry about anything else, except maybe chocolate and a cup of coffee. Of course, these days I can’t get anything done around here without being interrupted by little people about 50 times an hour. But that’s okay, that’s what I love about my life, the little people in it. It’s also like therapy because I spend time praying and worshipping. I always have worship music on while I sew. It may sound weird, but when I’m really yearning for an answer from the Lord, sometimes reading the word isn’t enough. Sometimes I hear more from Him when I’m not trying to listen, and a lot of those times, I’m sewing. Since the fire, I’ve had to make some things (I like to use the word “had” because it makes me feel a little less guilty, I guess). I have never been one to spend money on things that I can make myself, nothing has changed. Even though we had the opportunity to replace a lot of our things, I am still my thrifty, creative self. One of the first things I purchased for myself after the fire was my sewing machine. I just got a cheap Singer sewing machine (one you can get at most major retailers), but I love it just fine. It’s like the one I lost and I know how to work it, and let’s face it—it’s not like I’m running a sweat shop around here. So, the good ol’ (and relatively new) Singer does the job. I used to sit in my Grammy’s sewing room in the summertime and watch her sew. I was amazed at how easy it looked. One year, my cousin Brie and I stayed several weeks. Grammy gave us some material from some dresses she had made us when we were younger. We hand sewed some quilt squares and I remember thinking “why is this so hard? This looks so easy!” Pretty soon, I got the itch for learning to sew. My mom taught me a lot then, and I continued learning on my own. Recently, I’ve learned some new tricks through pinterest and blogging. Every now and then, I think I’ll start posting some of the projects I do on here. Maybe I’ll even have some tutorials. We will see. The next things on my plate to sew are some new pillow slip covers for our couches, and a valance for the kid’s bedroom, as well as a cushion for the bench in their room. I hope one day I can teach Caroline how to sew one day. Until then, I’ll just use it as therapy. Hmmm… maybe I’ll go sew something right now! Or… Maybe I’ll just go fold some laundry. What do you do to escape? Do you have any fun hobbies? I received this photo in an email from my mom and laughed. Then I got to really thinking about it. Although it may seem funny, most of these are lies. Not just any lies, lies from the enemy. I struggled for years with my self-esteem. My self-value was extremely low. My weight has always been a roller coaster and let's face it, this world is just mean! Girls (and even women) can be so very harsh when it comes to comparing themselves to others. Girls just say mean things. They take things that may seem insignificant and blow it way out of proportion, make up lies about you, and focus on your TINY problems. So often those are the exact problems or imperfections that you may be struggling with at the moment. Not to mention, all the magazines and "reality" shows, and movies that give every girl this False hope, and Fantasy about what one should look like, be like, act like, etc. Anyway, I never felt like I was going to measure up to this worlds standards. I was well into my adult life when I realized that was a lie. Everything I thought about myself was a lie. My parents, pastors, friends, and mentors always told me all the great things about myself . That was great, but I never believed them. In fact, the sick thing is that I told other girls the truth God had for them, and the promises he has for us, and how valuable they were, but didn't accept it for myself! It wasn't until I believed the truth about myself that I was healed. Ephesian 2:10 Even before he made the world, God loved us and chose us in Christ to be holy and without fault in his eyes. Ephesian 1:4 Think about the things of heaven, not the things of earth. When I decided to believe the truth that God had for me, I was healed. If you are struggling with self-value in anyway, or feel unloved this Valentines day, here is the truth for you. You have to love yourself before you can love anyone else. He can fill your heart with all the love you could ever want or need. He will satisfy you like the morning dew on the dry land. He cares for you and he wants you to care for you! So, this Valentines day I want to encourage you. Before all the roses and chocolates and couples make you sick to your stomach, Thank God for what he has given you. Buy yourself a chocolate candy bar and enjoy every bite! Spend time in His word and really soak it in. Hold tight to the promises He has given you. And maybe most important of all, focus on the TRUTH! Don't believe the trash the world gives you! He has a plan for your life, and you are SO VERY LOVED! My friend Sheri Yates has developed a Truth or Trash Ap for your iphone to help you distinguish between the lies of the enemy and the truth that comes from Him. Learn more about it here! Get it here! 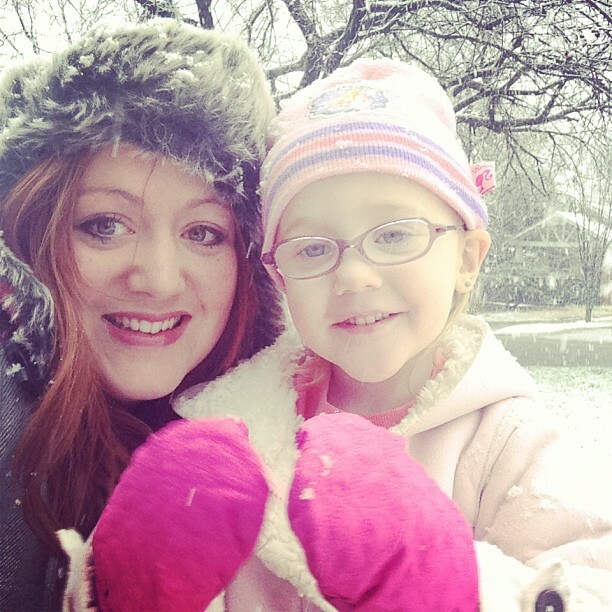 I don't know if it's snowing where you live, but we are excited about the snow here today! Caroline and I are sad that the boys are at work and school and can't join in the fun. She is zonked out in her bed for a nap so I thought I'd jump on here real fast and post some pictures. We haven't had a good snow in a couple years so this is pretty awesome. Tobin's teacher sent this to me, from school today when it started snowing. I can't wait for him to get home so we can play in the snow together! 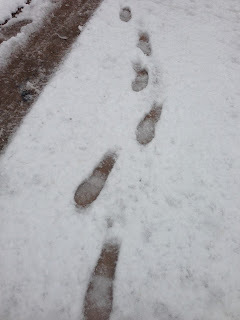 It's still coming down beautifully outside which means I'm sure I'll have more pictures to share tomorrow! There are glimpses of love all over my home. 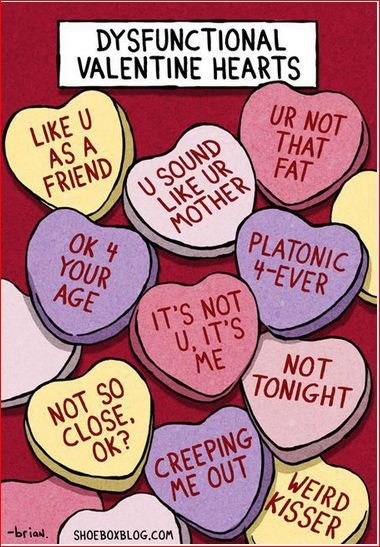 I love Valentine's day. Tony and I started dating 12 years ago, this Valentine's day. It's a fun day to remember back to where our relationship started. I'm not one of those "get out the big pink and red tub and decorate for Valentine's" type of people, but I do like to add my own little touches to the fun holiday. This year, it's not like we had a bunch of heart stuff lying around ready to showcase for Valentines day, so I got creative. January's Warmer of the Month was perfect. I added two little birds that I already had. We will call them love birds. When the fire happened, people gave us all kinds of things. Some were fabulous. Some were, well... let's just say we donated them. And some were fun things that I stowed away for later. Like this sign. It's not really my style, but it's Valentines day right? It's hanging on the kids bedroom door and they love it! My Aunt Carol sent me this table runner in Caroline's birthday package. I LOVE it! I'm a table runner kind of girl! You can't really see them in this photo, but there are Red Plate Chargers (that my mom gave me) on the table. We like our paper plates to be fancy like that, on Chargers. There may or may not be tissue paper pom-pom's hanging in my dining room still, left over from a Princess Tea Party (*ahem 2 weeks ago* That I still need to blog about). The colors work for Valentines right? Tomorrow I'm having my Scensty Team Meeting at my house. Aren't these little buckets cute? Giving is one of my life's greatest pleasures, and I LOVE spoiling my Scentsy girls! So, these buckets are filled with a little bit of love, just for them! Okay, you know I had to sneak in a pic of my two favorite little LOVES right? They were looking all Valentine-E in their red and white so I had to snap a pic. Aren't they cute? This is my Valentine's display. Now, let me tell you I spent not a single penny on this. I added the red burlap to my burlap bow at Christmas and well, let's face it, it works for Valentines Day. Red, Comfy Cozy Scentsy warmer, and just a Vase someone gave me that I put branches in (clipped from trees in the backyard). I wanted to hang something that looked like love, so I whipped out some little stuffed hearts and hung them with ribbon. They aren't the best thing I've made, but for 10 minutes of work, not too shabby. Tobin made this heart ornament at Christmas of himself and his sister. I just had to keep it aside for Valentines Day. It was my inspiration for this little display. Sweet, huh? The other red glitter hearts are recycled Christmas Tree ornaments. I told you I didn't spend any money. It just so happens red is on my Christmas Tree too. Get creative people! I Love this Thrifted chalkboard. I use it for so many things. I pretty much move it around my house and write different things on it because, let's face it, that's what it's for! Ha! ... and I love these little birds. They are super tiny (which you can't really tell in the picture) but I just love them! I turned them towards each other. They make me smile every time I walk by. This wreath is a homemade wreath. The grapevine was wrapped around my Christmas tree (pulled from outside- not kidding) and when I took my tree down I just used twine and made me some grapevine wreaths. I'm a sucker for wreaths! I know... it's a disease. I'm working on it. These two little foam/feathered birds were on my Christmas Tree too. Are you starting to see a trend? I took a piece of Fabric and wrote (with a Sharpie) "Love Birds". High tech, huh? But, it works. I love how effortless it looks (and really is). It's on our Master Bedroom Door. Okay, last wreath (for this post anyway). I promise. I had the kids make me some hearts and put them on our wreath with tiny wooden clothespins. Today we got a Valentine in the mail from my Mom and I added it. It's kind of like a Christmas Card wreath, but with Valentines. Okay, I'll stop talking about Christmas. Good grief! Close up of one of Caroline's. It has her and Tobin on it. My kids-- I tell ya, the are best friends and worst enemies, but more about that on another post. One of Tobin's was a butterfly. He said, "mom, I put your favorite pattern on here". I may or may not have a lot of Chevron (earrings, pillows, leggins, etc.). I'm not ashamed, I Love it! ha! Did this get your creative juices flowing? Everyone can have a little LOVE around their house too! What did you think of? I'd LOVE to see it! Post your link below. About two weeks ago, I was stressed. I was very stressed. Our tenants, who were supposed to lease our house through May (The house that we leased out to move to Luther and get out of debt, remember that house?) told us they were moving out January 31st and we hadn't decided what we were going to do. Do we rent out our home again? Do we move back in? Do we try to sell it? We had prayed together, talked countless hours over our options, and decided we needed to try to rent it out again. There are a ton of reasons we decided to do this. 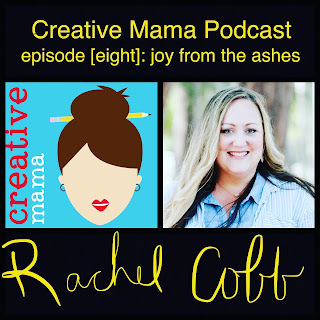 One of the most important reasons to me was that even if everything else worked out I didn't want my kids to have another HUGE change, and it would be so hard right now to move back into that house with none of the things we used to have there (furniture, clothes, appliances, etc.). Are ya feelin' me? Okay. Anyway, back to the story, 10 days ago I was still really stressed because we had no potential renters, when I buried my head in my Bible for a few hours and got on my knees and begged God to take care of this situation. More than that, I wanted to know that everything was going to be okay, and without draining every dime we had in the bank. I got a clear answer. In my praying and pleading it's as if I heard God tell me "10 days Rachel, you will have your answer in 10 days". I marked my calendar for February 9th (10 days) and I didn't stress any more. I waited. We put an ad on Craigs-list, sent it out through social media and Facebook, and nothing happened. Nothing at all. Normally, this would seriously stress me out but it didn't. I knew when the 9th got here, we would have our answer! Well, a few interviews of potential tenant's squeaked in and Tony met with them Monday, and again on Thursday. We weren't impressed and definitely didn't have peace about any of them. We tweaked our ad a few times and resubmitted it so it would be at the top of the list when people searched for homes to rent. Still nothing. So, yesterday we got 2 phone calls for appointments and today Tony went to the house to meet them. I bet you know what's gonna happen right? Well, the final outcome may seem predictable, but God had his had in it the whole time! Both families saw our ad on Craigs-list and called. Both families knew us from church, and didn't even realize it! That's right, reliable christian people who go to our home church campus. I know what you're thinking, "Seriously?" Yep! So, the family we are praying about wants to move into our house to get out of debt, and have more financial margin. Isn't that incredible? God is using our home, our story, our life, to bless other people! I don't know how we could ever deny this sweet family of God's blessings, but we decided to pray about it for 24 hours. We want 100% complete peace about the situation. I'm already there, because I know only God could do this. You see, all we prayed for was renters. We would have been fine with people without a story, just renting our home. God knew we needed to be blessed, and his blessing stretched to another family too! I am in such awe of God's greatness right now. He wants to give us the desires of our hears if we will just delight ourselves in him! He has everything under control! The fact is, even if something were to happen tonight and this family fell through, I know he is still faithful! He sent them to us today because he wants us to know he loves us, he is taking care of us, and it's no coincidence! What I'm about to say doesn't come from pride, but with a heart of humility and full of Grace. The Cobb family doesn't believe in Coincidences anymore! We expect God to work in amazing ways that are unexplainable by human means alone. Read this blog, keep up with us, and get to be our friends. If you don't believe in the power of Christ, you will after hanging out with us for a while! He never ceases to amaze us! Every single thing the enemy strives to get us with (sickness, debt, hurt relationships, fire, broken leases) the Lord comes back around and it ends up being so much greater than we could have possibly imagined or intended! Give your heart to the Lord, follow his desires, delight yourself with Him, and he will come around and bless you. Thank goodness for Grace! We are so undeserving! God gets 100% of the glory!!! Tonight I told the kids to clean the playroom. I went in 10 minutes later and it looked the same, actually it may have even looked worse. I did my "mommy warning" and told them I would be back in 10 minutes. Before their 10 minutes were up, Tony went in there to check and give them the "you better hurry up before mommy sees this" speech. 10 more minutes pass and I go in to check on the progress. What did I see before me? Two children playing contently. Seriously? Did my warnings not mean anything? So, what did I do? Tonight, I did something different than I normally do. On a normal night I would help them clean up because I'm so tired of talking about it and watching them delay bedtime in 10 minute increments. Not tonight. I said, "okay, you have 10 minutes to clean this play room and I'm going to sit here and watch you do it". I bet you can guess what happened next. Yep, you guessed it. They cleaned the playroom in their allotted time slot, and did it all by themselves. It's called accountability. Even as an adult, we need accountability. Tony and I are eating healthy, and have committed to 38 days (5 weeks) without cheating. It's a lot easier when he is here on his day off, and we eat meals together and spend the day together. Monday, I'm going to have a hard time when I make Caroline her peanut butter and Jelly sandwich with yogurt and Cheetos on the side. So, for my own accountability, I've been sending him pictures of everything I eat. We have made our own "rewards" for making it the 5 weeks without cheating. A little motivation never hurt anyone; However, it would be a lot harder if I bribed myself with a reward, yet had no one to hold me to my actions. Tonight, accountability worked for my kids. (Now, if only I could figure out how to stop the crying fits when it's bed time...) Do you have accountability in your life? Tuesday I went to Scentsy's Spring Sprint Event in Park City, Kansas. It was excellent! I rode with 3 other ladies and we had so much fun talking about life and Scentsy, of course. I love going to my Scentsy events because I always leave ready to share Scentsy with everyone I meet. It reminds me of Why I started doing Scentsy, and why would I want to leave anyone out of this amazing blessing? It reminds me how blessed I am to get to stay home with my kids, give more, and share Christ with more people. Yes, what better way to share the love of Christ than by being invited to come into someones home to put on a party? I know... genius! I'm so excited about the new catalog season coming up! Let me tell you, it's the best catalog Scentsy has ever introduced! I feel so blessed to be a part of this amazing company! 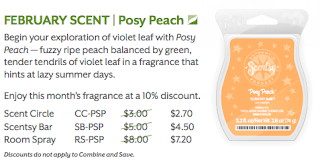 If you've ever wanted to try Scentsy, now is the best time because everything s 10% off in the month of February. If you've ever wanted to make some extra money, or need a hobby, or need to get out there and meet some people, now is the best time to join this amazing company too! In February, you get double the value in your starter kit! 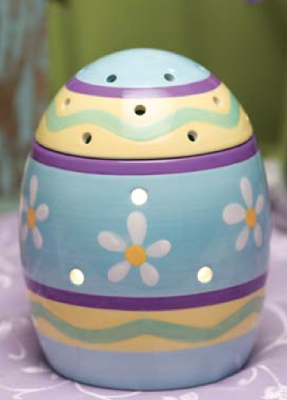 The warmer of the month this month is Easter Egg. Isnt' it cute? 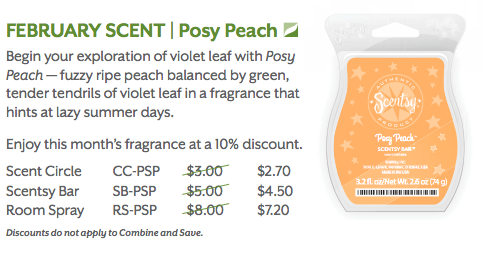 The Scent of the month for February is Posy Peach. It is really yummy! If you'd like to order or join my team click here or email me at therachelcobb(at)gmail (dot) com. I'd love to answer any questions you have as well! I'm also super excited because I just earned Scentsy's incentive trip! I get a 6 day, 5 night all expenses paid trip this summer! I can't wait to tell you where I'm going to go! Stay posted, I'm sure I'll give you all the details!